A table setting by my mother. I celebrated my birthday last month at my parents’ house in Virginia and my mother was kind enough to set a beautiful—and impromptu—dinner table. I like to joke that I am missing the decorating gene but I certainly appreciate the art of the table and the work involved in bringing all the lovely pieces together in harmony. My mother asked me what I wanted the table to look like and I just said gold and glamorous. I can’t help it. By time August rolls around every year I want everything to look like a gold sequin. It must be the summer heat. ...and the red and gold candle holders! Both are by MacKenzie-Childs. I do adore a bit of tulle. Spoon in the prosecco to keep it bubbly. I learned that from Dorie Greenspan. 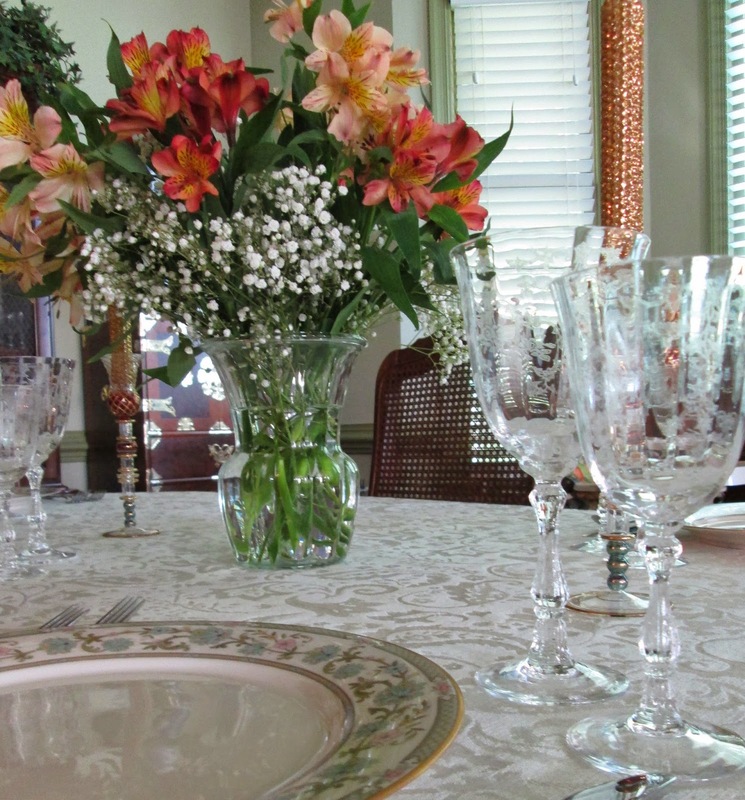 My mother set the table with her very pretty Noritake china in the Miyoshi pattern and Lenox etched crystal wine glasses, in a pattern called Navarre. I loved the colors of these Alstroemerias and of course no birthday dinner is complete without prosecco! We picked up a bottle of one of my favorites, Lamarca. I don’t know if the ol’ trick of putting a silver spoon inside the bottle actually does extend the life of the bubbles, but I learned this tip from none other than Dorie Greenspan, who noticed Paris waiters did the same with opened bottles of champagne in restaurants. If it’s good enough for them, it’s good enough for me! I don’t own any china at all and have a limited collection of crystal wine glasses so the opportunity to share in the beauty of these wonderful pieces of tableware felt like such a treat. They add to the pleasure of sharing a meal with family! I am also crazy for chandeliers! 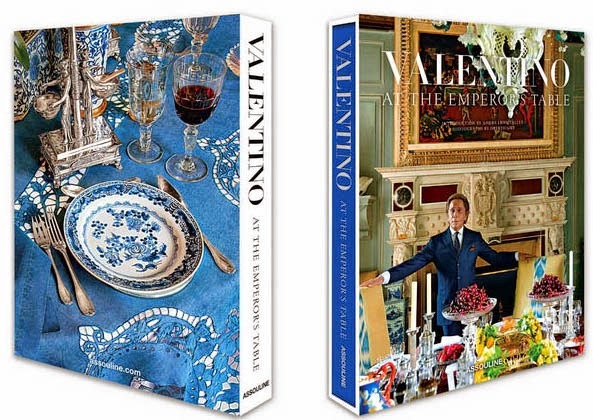 The back and front cover of Valentino: At the Emperor’s Table. My mother recently told me of a book she learned will be published in October, Valentino: At the Emperor’s Table. It looks like a stunning (and gigantic!) book, based on the pictures available for view at Amazon. It also reminds me of what Oprah once said on her show about the couturier: “Nobody lives like Valentino.” He loves a fancy table as much as my mother does (me too, for that matter). Isn’t this setting gorgeous? I especially love the green rims of these glasses. At Valentino’s Swiss ski chalet in Gstaad! Valentino and I both love pugs. His name is Stewie and he belongs to my brother and his wife and is constantly in trouble, which is why I like him so much. 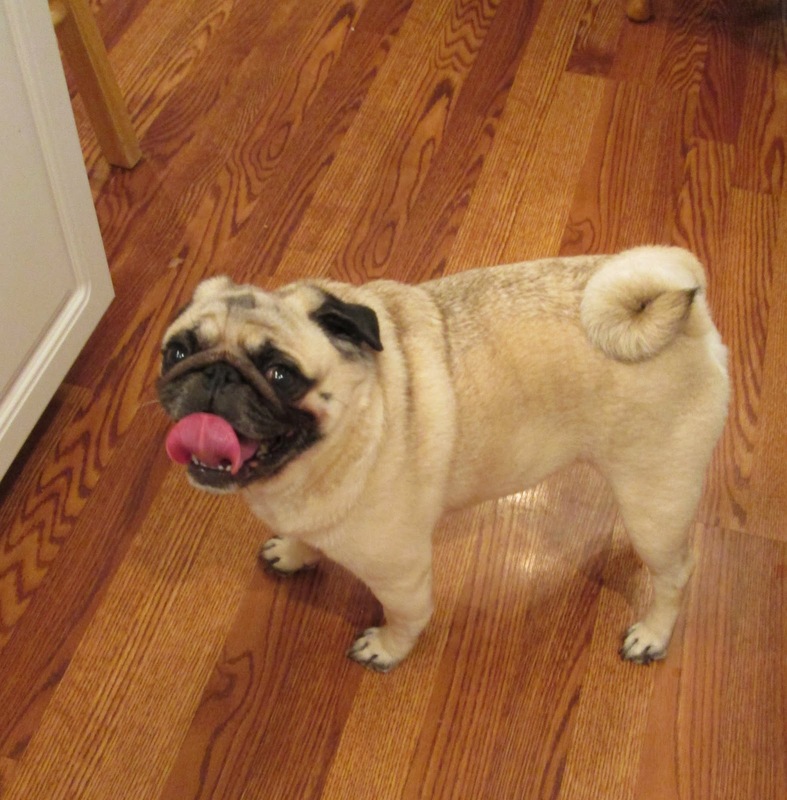 Also, he has the longest legs I have ever seen on a pug. I tell my brother all the time he should make Stewie a dog model! 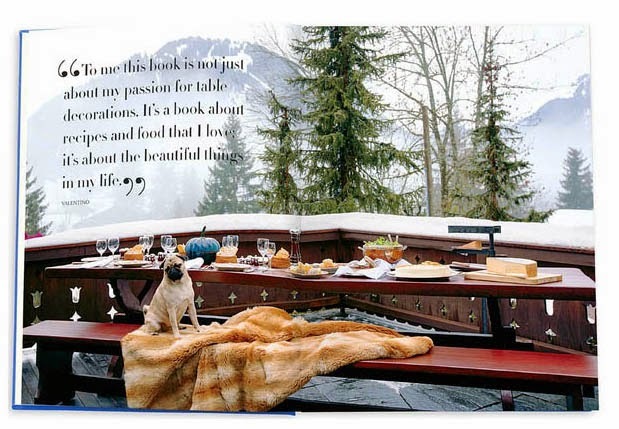 Do you like pugs or fancy table settings? Do you own china or crystal wine glasses? Do you use them often or for special occasions only? Tell me everything! Well, I have to have to the book...thanks for telling us about it, Jill. And your mother has exquisite taste...beautiful table setting! All right! Birthdays, everything like a gold sequin, some bubbly, fancy china, a cute pug---sound amazing. Plus, mom doing it for you. It's the best when mom does it for you!!! Lovely photos. I used to do fairly elaborate table decorations for dinner parties. Nowadays it is much more casual. I just don't seem to have the time or energy these days. Your mum certainly does keep a good table. I have a lifelong friend who always send me pics of her Thanksgiving and Christmas tables she so lavishly lays out prior to guests arriving. When done well, as by your mum and my friend, it makes for an even more glorious occasion. I like Stewie and he looks to have treats and table scraps on his mind. Is Stewie the dog, named after Stewie in the Family Guy? 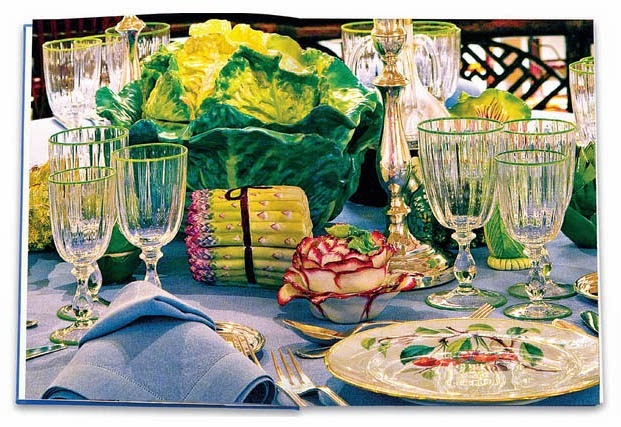 Love fancy table settings, for Thankgiving, Christmas or Easter. I still use my white Noritake Ranier china set & I always combine colored plates, candles flower, napkins to represent the occasion. The rest of the year is casual. When I saw the table photo come up on my reader I just had to read! I am a table fanatic. Some time ago I decided to use everything, everyday and I do. It only takes a few extra minutes but I want my day to day activities to reflect the life I want to live, even if it is just in my table setting choices. I am almost embarrassed to admit that I have 12 sets of china, stone wear, pottery and special occasion dishes and I use them all. Love my dishes. I have a storage room, it is full. To make the 'everyday' special is a gift to yourself. Mr. Stewie is adorable. So sweet of your mother to make this wonderful dinner for you. Such pretty table settings - flowers, candles and everything. The glasses are beautiful and I like the idea of the tull around the napkins. Never thought of anything like that before. Hi GSL, ooh you are lucky if your friend sends you pictures of the tables she creates for holidays. I love seeing personal ones, not ones in magazines, though of course I would not say no to seeing what Valentino has on his table! Hi Rosie! Ha, why yes, Stewie IS named after the character in 'Family Guy' my brother and his wife have a great sense of humor! That dog cracks me up, he is always so energetic and frenetic and never fails to make me laugh and give me a boost. I wish I could see him every day. I love to set a pretty table with care and flowers and candles...your mother has attended to all those details. I believe that food tastes even better when dining at a beautiful table dressed for the occasion. I hope you had a wonderful visit and thank you for sharing this with us.